The role of drawing is fundamental to my work. 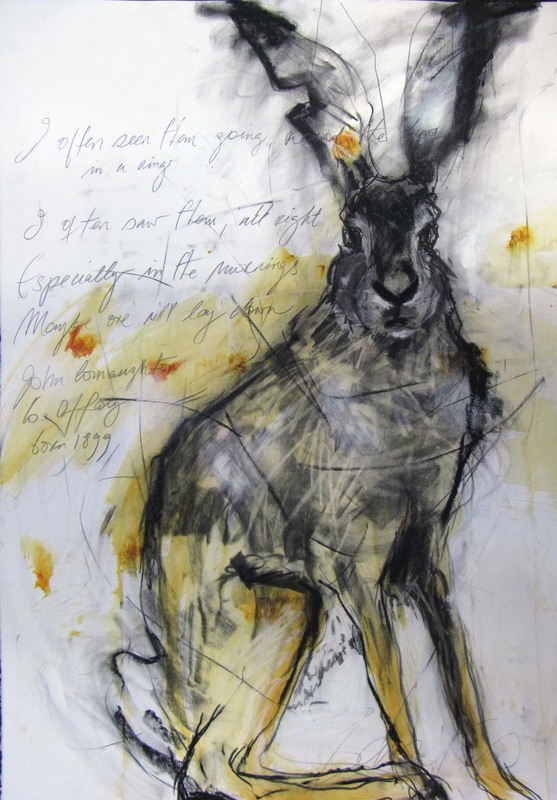 Whether it is drawings of crows or hares, these are sometimes prefaces to paintings, and sometimes a relaxation from them. They are works in their own right. They are witnesses to the changes in the landscape of Teeromoyle in South West Kerry – my mother’s place. My mother died quite young but I was reared on her stories about her childhood in the mountains, so family and a sense of place haunts my work. My mother’s past is my past. Her parent’s house is long gone but the field where the house was remains unchanged and I have painted this field and in this field many times. Painting the field sometimes makes me feel snug, warm and sheltered and other times exposed, vulnerable and turbulent. I remove layers of earth while adding layers of paint. This is my subject matter, not the meaning of my paintings.